This is the funniest movie that I have seen in years. It is an instant classic. What makes this movie great is that it takes a page out of our lives and tickles us with it for 107 minutes. Other movies along the same vein are Vacation, Christmas Vacation, Office Space, etc. However, in the case of Meet the Parents, we get not only familiar situations with a twist of humor, but we get side-splitting, make-you-sore-for-the-next-week-from-laughing-so-much humor. And what is really great is that this movie does not stoop to levels of what I would term as "Funny, but disgusting and really stupid." Both 1999's Austin Powers: The Spy Who Shagged Me and 1998's Something About Mary were both extremely funny, but I felt much dumber after watching them. 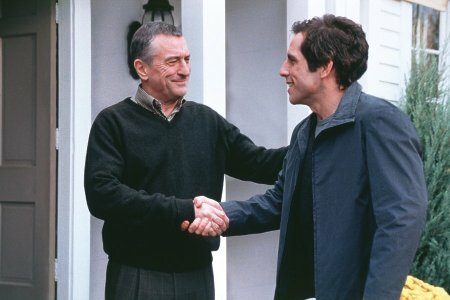 In contrast, Meet the Parents uses awkward situations, a little slapstick comedy, and almost ingeniously hilarious performances, especially from Ben Stiller, as Greg, and Robert De Niro as Greg's potential father-in-law. The story centers around Greg (Stiller) who just before proposing to his girlfriend thinks the better of it and decides that he should meet her parents before entering into a lifelong commitment. Now this can always be an uncomfortable situation, but I can't think of any as uncomfortable as having De Niro, as Jack Byrnes, the girlfriend's father. From the moment that these two meet, everything is hilariously perfect. De Niro is distant, untrusting, and critical. Stiller, desperately trying to impress him, is clumsily making all the wrong moves. And his girlfriend, Pam (Teri Polo), suddenly begins showing an unpredictable, never-before-seen side of herself. The supporting cast is perfect as well. Everyone from the aunts and uncles to the siblings and friends seemed to echo someone in my own life. 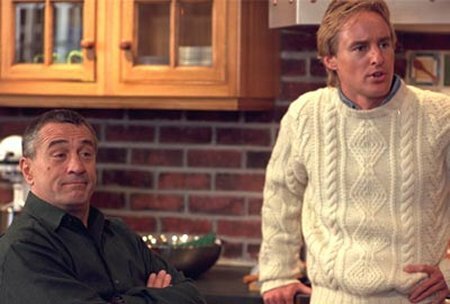 I especially liked Owen Wilson (below) as Pam's ex-boyfriend. The way that they used his character was perfect. But the real pleasure in this movie comes from watching the interaction between De Niro and Stiller. De Niro is simply a genius. What else can I say. And watching Stiller slowly evolve from a shy, clumsy, foolish suitor trying to impress everyone to an on-edge, pissed off, and hopeless failure (and back) was great fun. The bottom line is that this is one of the funniest movies that I have ever seen. I was actually physically sore coming out of the theater from laughing so much, as was my friend, Steve. This movie does everything that you could possibly want a comedy to do. It is for that reason that I bestow my highest rating. I also really enjoyed watching this in a packed theater on its opening weekend. The audience was laughing the entire time, and I was able to feed off of their energy. However, because of the outbursts of laughter, I probably missed about a third of the movie because I couldn't hear what was being said. Needless to say, I'll be seeing this one again. Don't miss the funniest movie of the millennium. 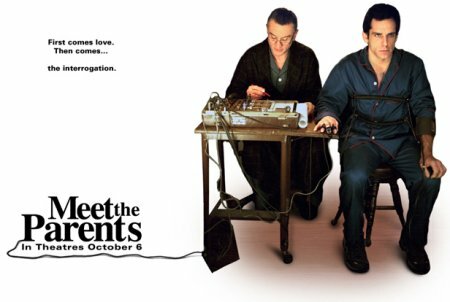 How would you rate the movie Meet the Parents? There have been 18910 people to visit this page since Sat, Oct 7, 2000. And you are the first person to visit this page today!